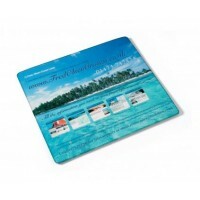 Aqua Mat is a welded mouse mat containing 2 or 3 non-mixing liquids. Creates an everlasting, stress relieving display. A selection of standard shapes are available. Coasters also available. 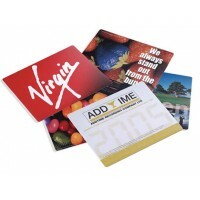 Using a promotional mat keeps your message in prime position on your clients desk. Tough top layer welded to a 2mm thick, soft cling base. 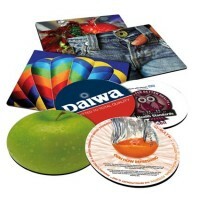 The Armadillo Mousemat can be recycled. Also available welded on three sides only, allowing user to insert their own frequently changing information or favourite photograph. A selection of standard shapes are available. 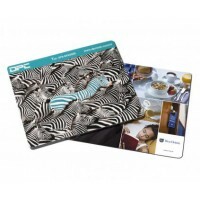 Using a promotional mat keeps your message in prime position on your clients desk. Britemat Round or square mousemat with stunning colour reproduction on pantone matched spot colours as well as full colour process images. Hard wearing surface, designed for use with traditional balled mice as well as optical mice. Non skid backing.